The World Wide Web is 20 Years Old! WOW!. On August 6, 2011 the World Wide Web turned 20 years old. Sir Timothy John “Tim” Berners-Lee, OM, KBE, FRS, FREng, FRSA (born 8 June 1955), also known as “TimBL“, is a British physicist, computer scientist and MIT professor, credited for his invention of the World Wide Web, making the first proposal for it in March 1989. On 25 December 1990, with the help of Robert Cailliau and a young student at CERN, he implemented the first successful communication between a Hypertext Transfer Protocol (HTTP) client and server via the Internet. Berners-Lee is the director of the World Wide Web Consortium (W3C), which oversaw the Web’s continued development. He is also the founder of the World Wide Web Foundation, and is a senior researcher and holder of the 3Com Founders Chair at the MIT Computer Science and Artificial Intelligence Laboratory (CSAIL). He is a director of The Web Science Research Initiative (WSRI), and a member of the advisory board of the MIT Center for Collective Intelligence. 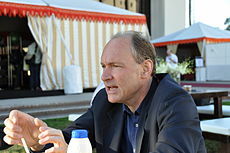 In 2004, Berners-Lee was knighted by Queen Elizabeth II for his pioneering work. In April 2009, he was elected as a member of the United States National Academy of Sciences, based in Washington, D.C.